For a change we had some clouds and a light breeze which made conditions bearable. 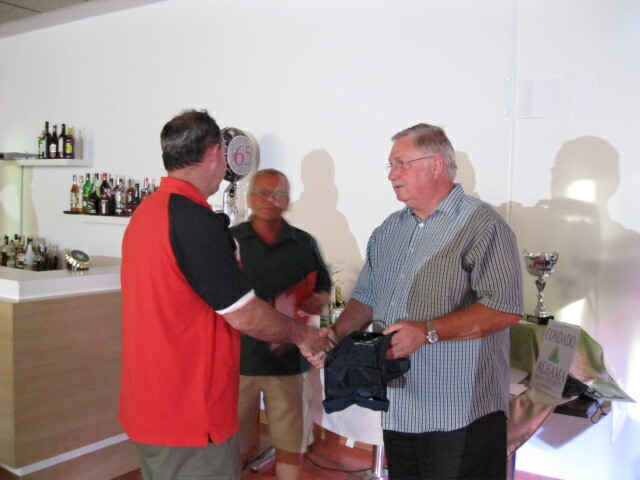 63 players took part in the lone ranger (yellow ball) competition and the winners won by a country mile, with 2nd and 3rd places contested fiercely..
With the golf shop now open in the new clubhouse (we won’t call it temporary again) the norwegian contingent decided to have their own opening party outside on the terrace. Got a rare photo of Paqui and Antonio (the marshall)……………. 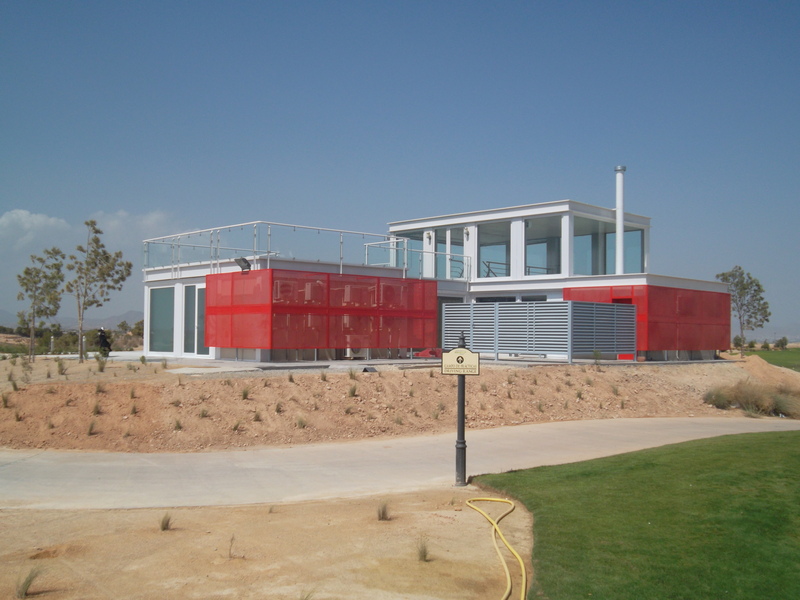 Below are some more general shots of clubhouse and surrounds……….. The red aircon covers are a contrast……………………. 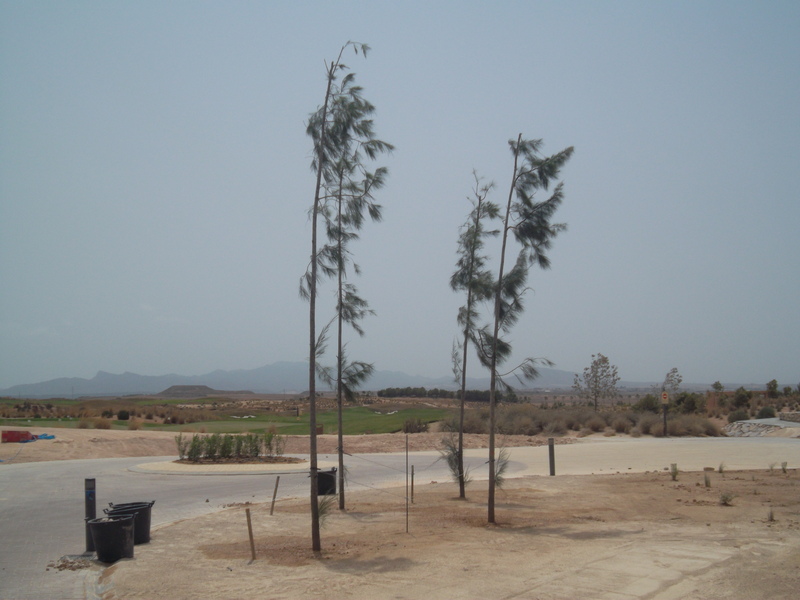 These tall trees are a feature near the buggy roundabout………….. The buggy path with hedge…………………. Lots of flowering shrubs between the buggy path and chipping green……………. 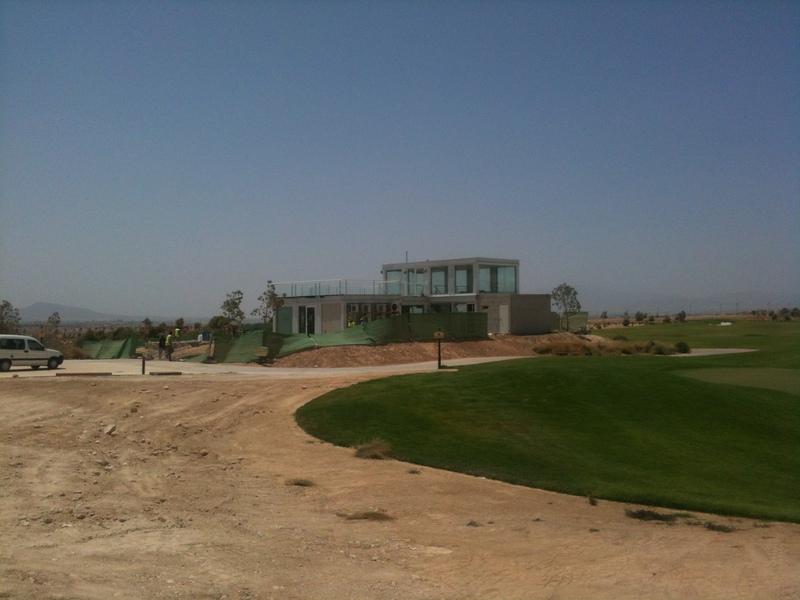 Side view of clubhouse and planted area…………. 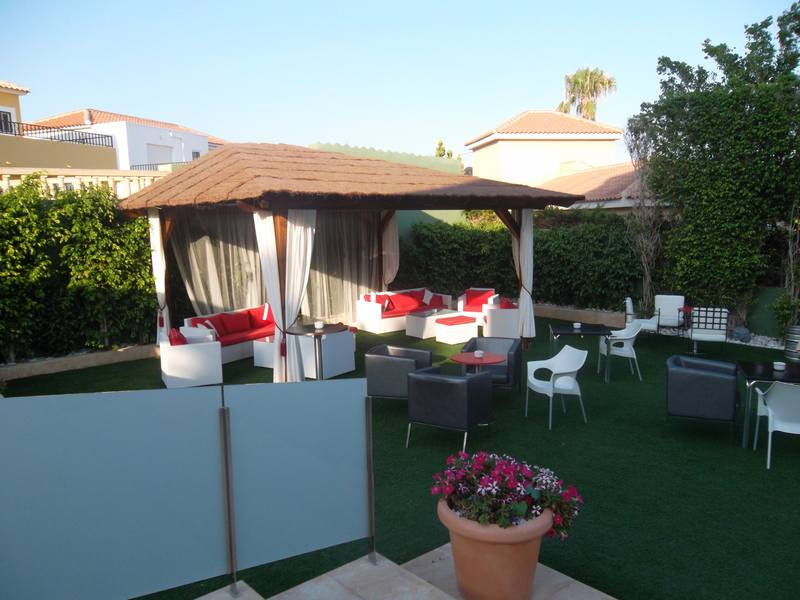 Walled area around the terrace…………………. 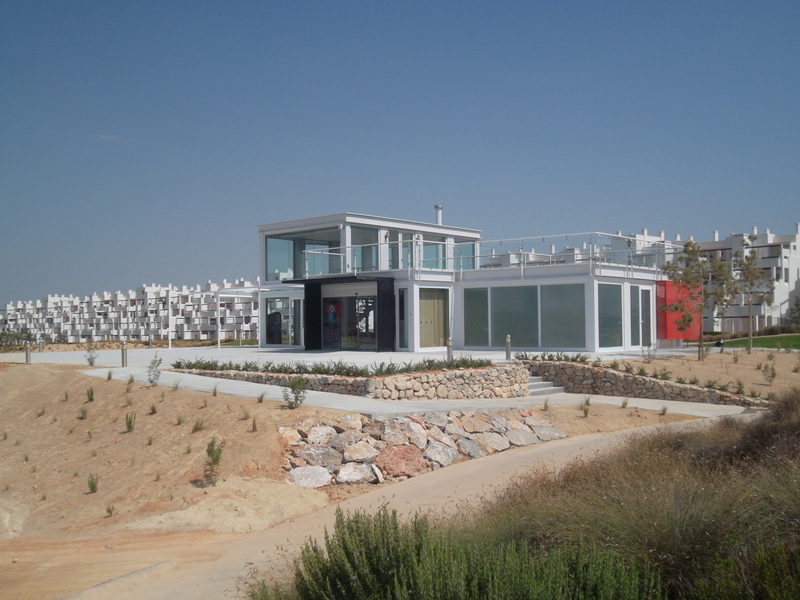 After many weeks of hard work the Condado de Alhama Signature course finally has a clubhouse (temporary maybe) to welcome golfers from around the world. The finished article is far better than any of us expected with everything to a higher spec than we imagined. Thanks to the banks (IRM) for investing in our future – this will undoubtably attract not only holiday golfers, but professional tournaments also. Previously, golfers have played here and commented how good the course is, but without a 19th hole they will go elswhere in the future. What remains to be done is to advertise the changes at Condado and players will surely come flooding back. Already the Hi5 tour have planned to come back to us in the autumn. 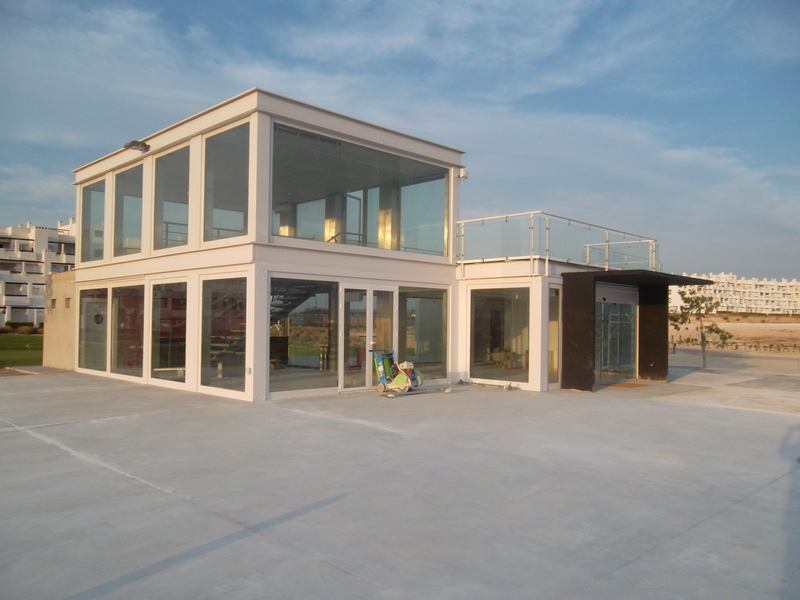 The views from the upper terrace are sensational and the clubhouse is sure to attract both golfers and non-golfers for the odd drink or 2. We are still awaiting delivery of tables and chairs for both the outside and upper terraces but I am sure they will be here very shortly to coincide with the opening of the bar. The society noticeboard has been moved and is prominently displayed in the entrance hall. The bar will soon be complete and hopefully will be in operation next week. It looks like there will be a variety of tapas dishes on offer, and maybe hot food as there appears to be suitable kitchen equipment installed. 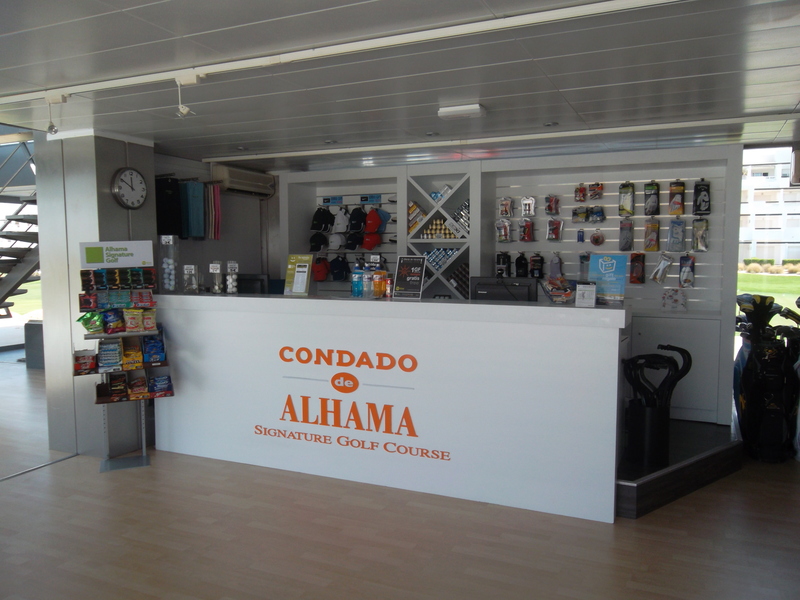 The new attractive shop counter looks very good…………. Not a big selection but adds colour to the entrance……………………. Also the shortage of buggies should soon be rectified – 30 new buggies should be delivered in August. 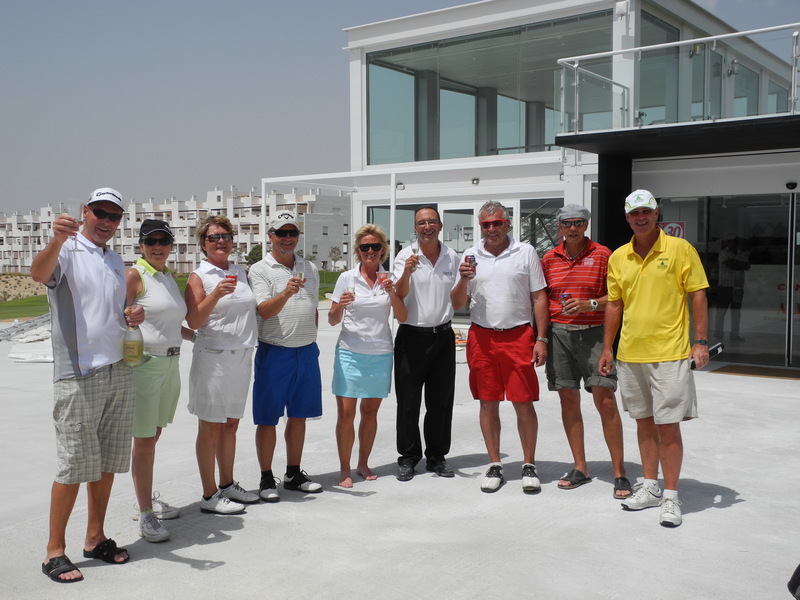 The marshalls are providing a mobile cold drinks and snack service – ring the clubhouse (968328008) and they will fetch you order to you on the course. 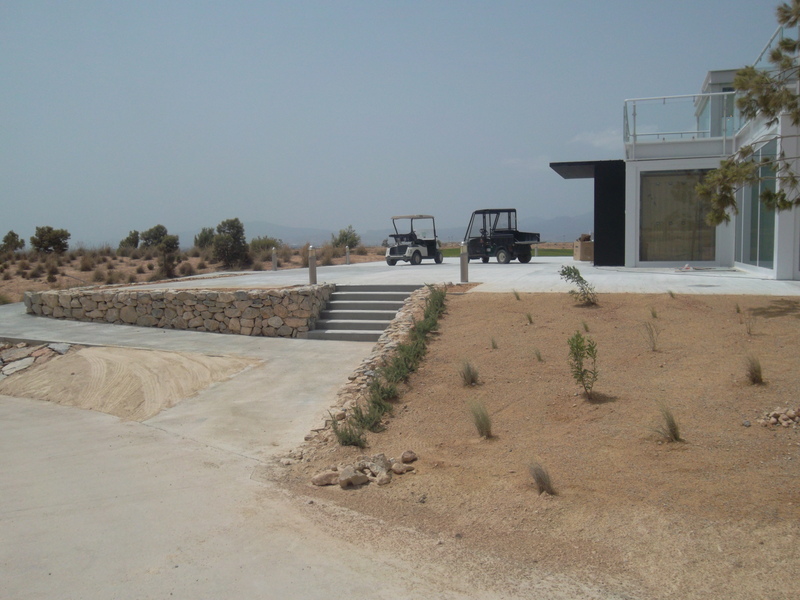 Finally the services we require are here to supplement one of the best golf courses in Spain. After spending 10 days in the UK I couln’t help the organisation as much as normal so thanks must go to Cath, Kevin and Graham who ensured everything went off smoothly. 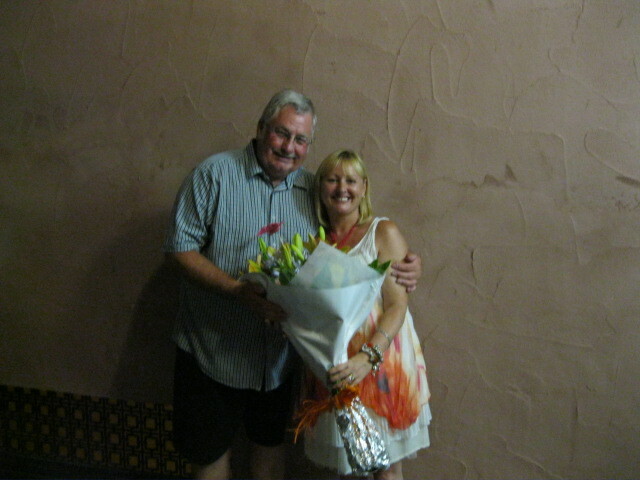 Cath is pictured with the glass flower vase which myself and Paul bought as a thankyou. 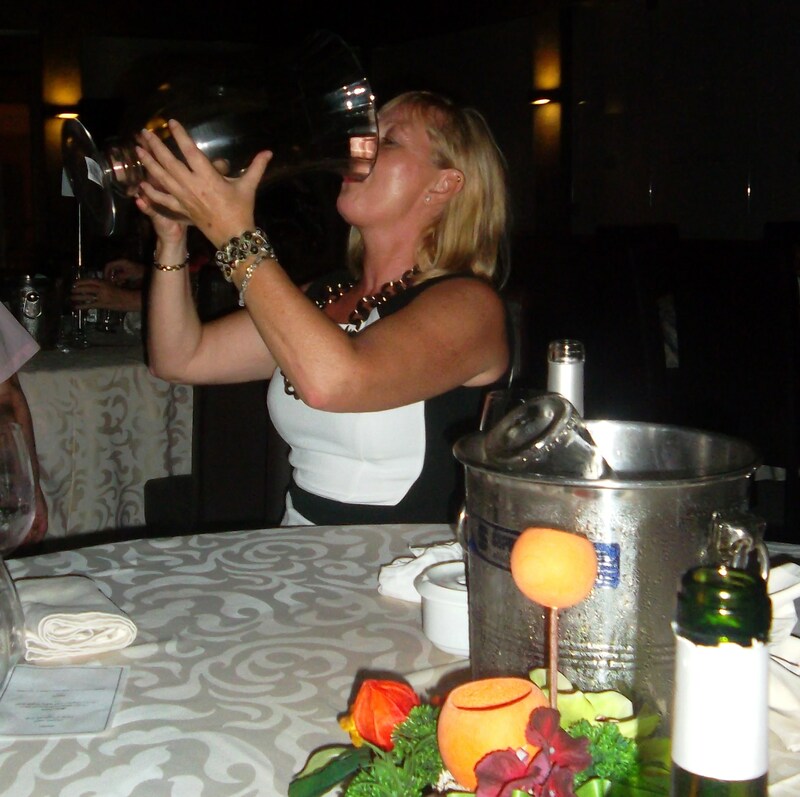 I think Cath may have been confused exactly what it was for!……………….. It was again a hot sunny day which was great, but this also impacted on the 67 entries. The decision by Global Golf to remove 8 buggies to another of their courses meant that many players who requested buggies did not get them. Some took the option to not play in the baking sunshine after they had arrived and simply turned around and went home. This was quite understandable and I suggest anyone who is unhappy with these actions by Global Golf either writes or emails them – otherwise they will assume no-one is bothered. Anyway, the tough examination posed by the strokeplay format produced some worthy winners. 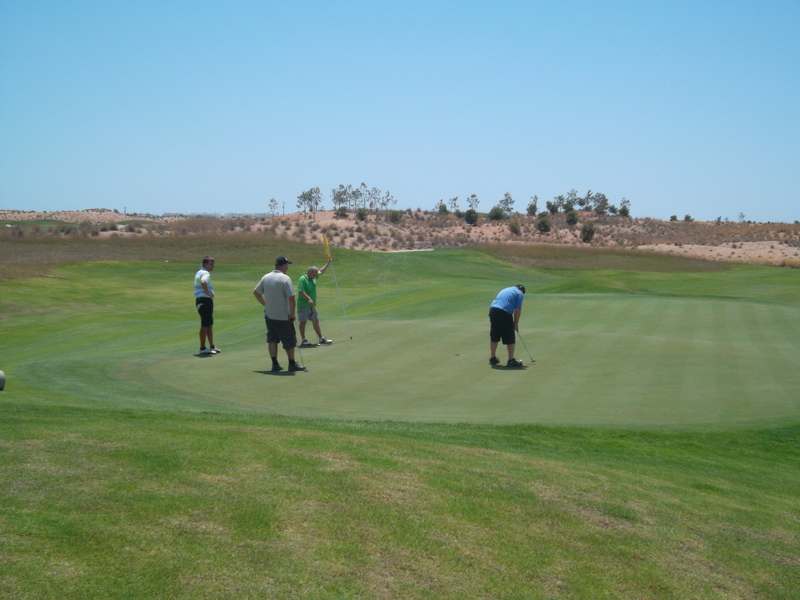 In fact 11 players managed to reduce their handicap on the day, with only 3 players putting in a no return. There was an amazing tussle for the junior prize with 3 juniors taking part. Daniel Markenfeldt (who is only 10 years old) must have thought he had won it with a nett 60 off 20.6 handicap. 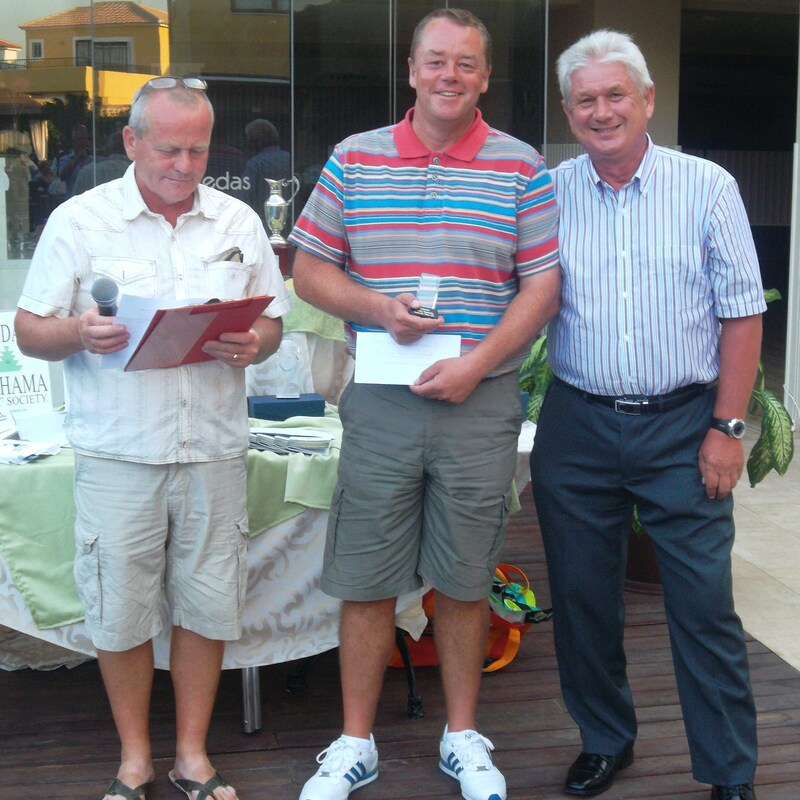 But Paul Harrington jnr pipped him with a nett 59 off 28 handicap. Both players will find it a little harder to play off their new handicaps this week! We will need to look at the position of juniors in the society regarding age limits, tee boxes, eligibility for competitions etc at the next committee meeting. 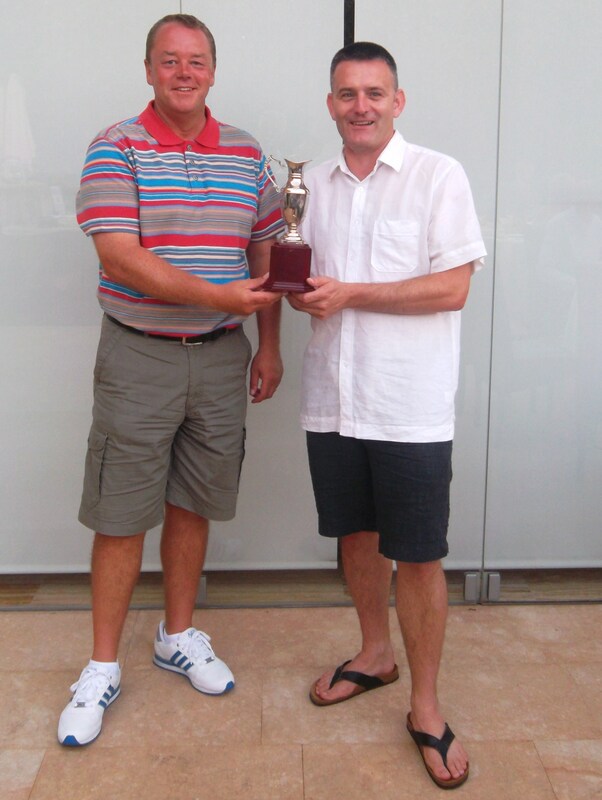 The Scratch Cup was also keenly contested with Paul Harrington having a fantastic level par round of 72 off 3.1 handicap, but as he donated the trophy he kindly passed the award to Stuart McColm (77) who tied the next best score with Paul’s son Fred (scratch) and Christian Markenfeldt (4.4). With a back nine of 37 Stuart took the trophy. Putting out on the 18th………….. 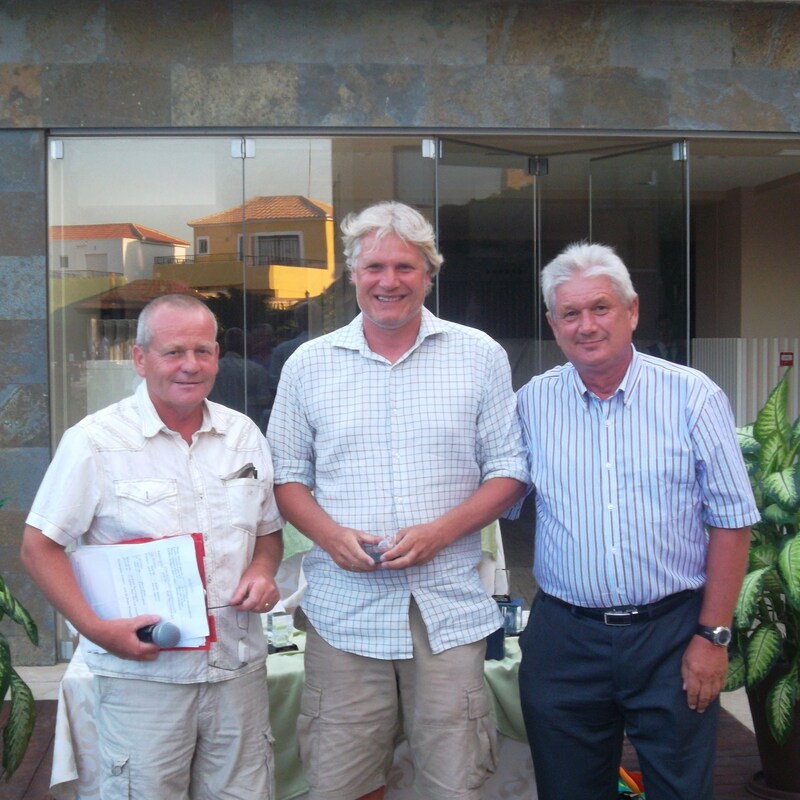 The swiss family Harrington….Fred (scratch); Paul (snr) 3.1; Paul (jnr) 28 (not next week though!)……. A reminder of the rules……. players have only 5 minutes to search for their ball. Slow play frustrates everyone. If it is not immediately visible then wave the following match through. 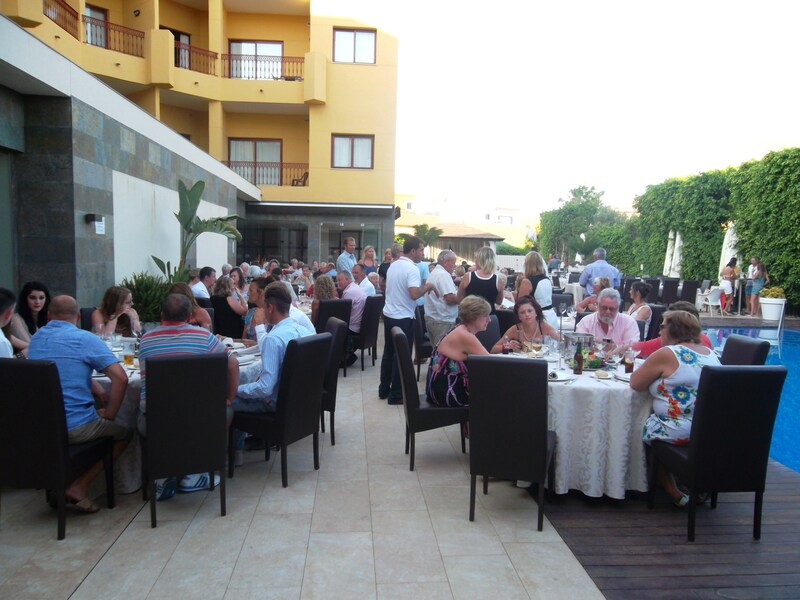 The evening celebration was a great success…….everyone thought that the Amopola restaurant was the best venue yet. Everyone was seated around the pool, and the previous complaints about the heat inside Trevis and the Condado club were forgotten. Service was top class, the meal was great value at 15 euros with a bottle of wine and 4 courses, drinks were cheap and the waiters were polite, funny and helpful. Christine King was a great act singing popular numbers and was supplied free by the Amopola for the night. Definitely a place we will return to. No one fell or had to be rolled off the bus this time, and a great singalong on the bus on the way back to the Clover for a nightcap. 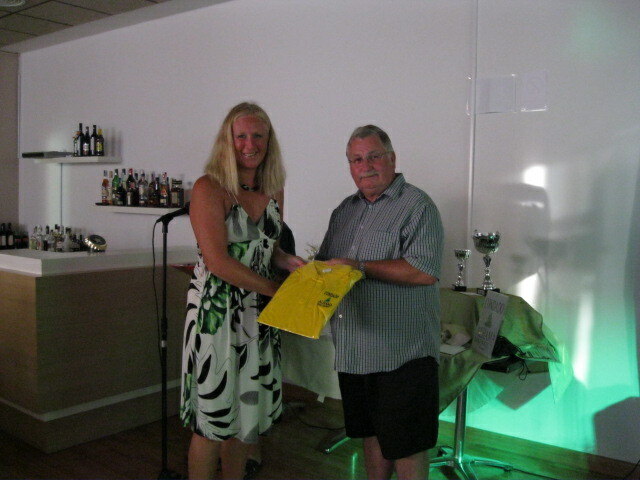 Just for a change we had trophies (and vouchers) rather than prizes………………. Photos of the winners below………. Junior champion? I must be a dwarf! Think he grew another 2 inches during the evening! 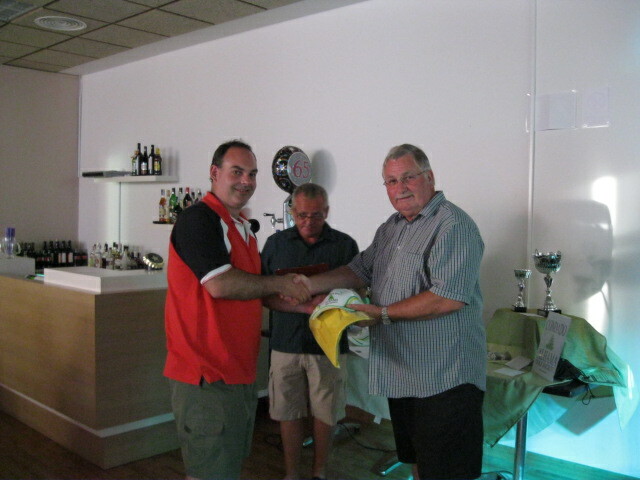 Paul presents the Scratch Cup to Stuart……………. 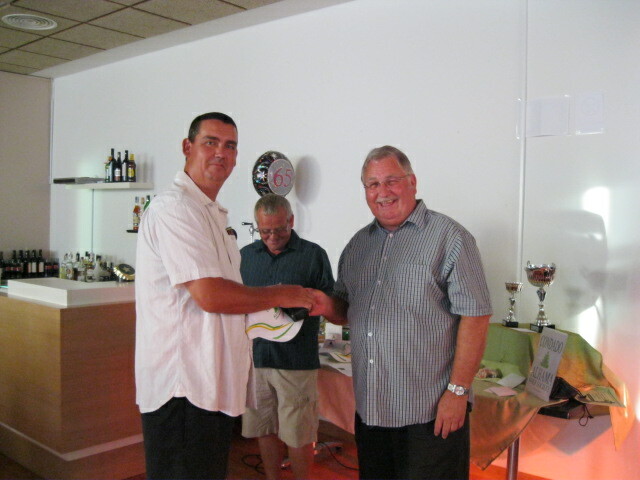 Looks like a cap for Torkild and a scorecard holder for Tim mean a lot!……….. Photos from the fabulous Amopola…………………. 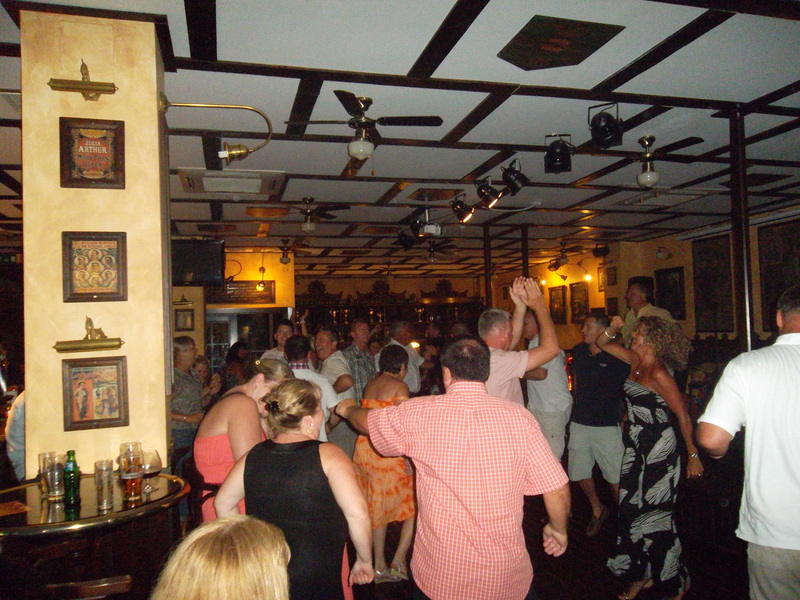 Over 90 people came to the presentation and party……………..
Outside bar and waiter carried drinks to your table…………. 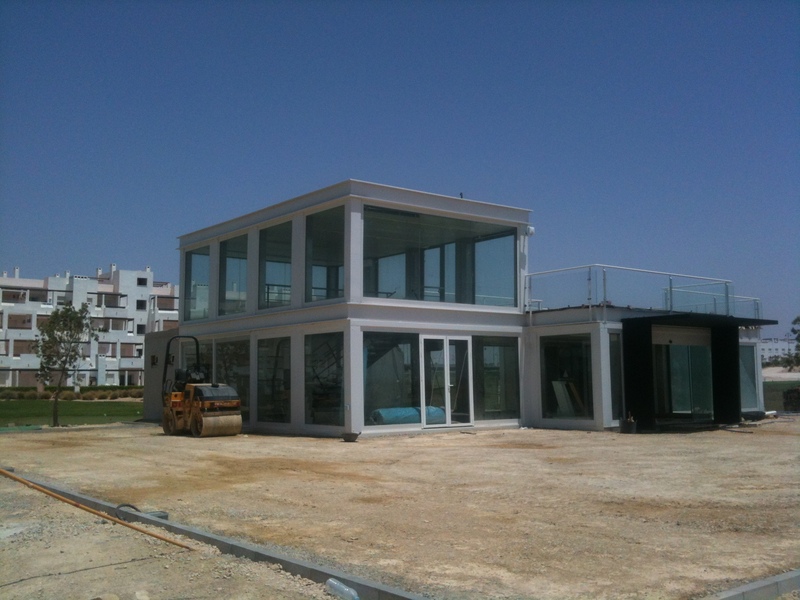 Construction work on the clubhouse is now complete, and hopefully furniture etc. will go in this week. 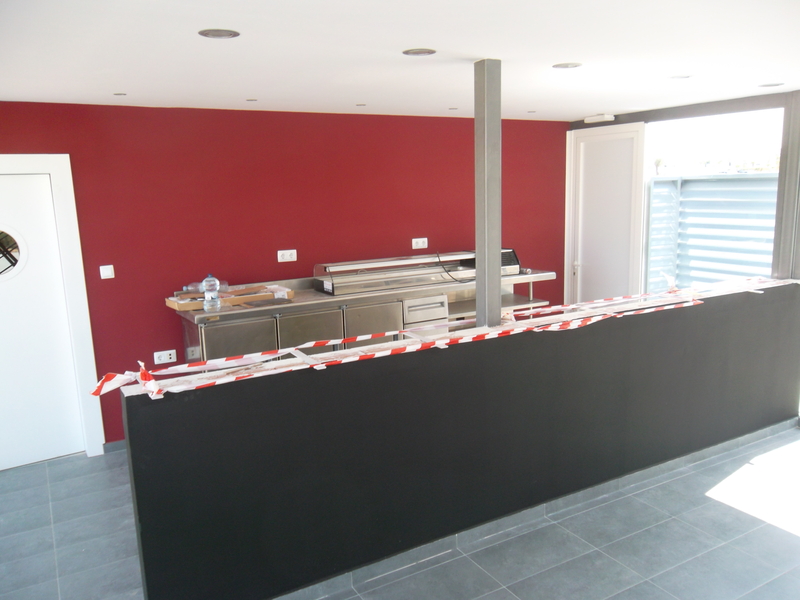 Staff in the golf shop hope to move this Friday, but the bar won’t be ready by then. 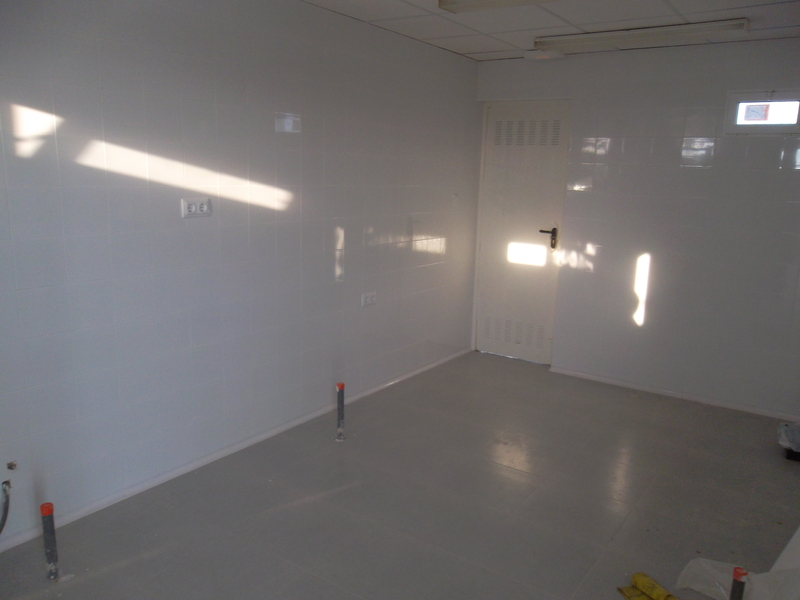 The shower areas and toilets look to be almost finished. Lets hope that players don’t go to the shop on Friday and find it empty – information download has never been a strong point at Condado! Everthing just about done outside………………. 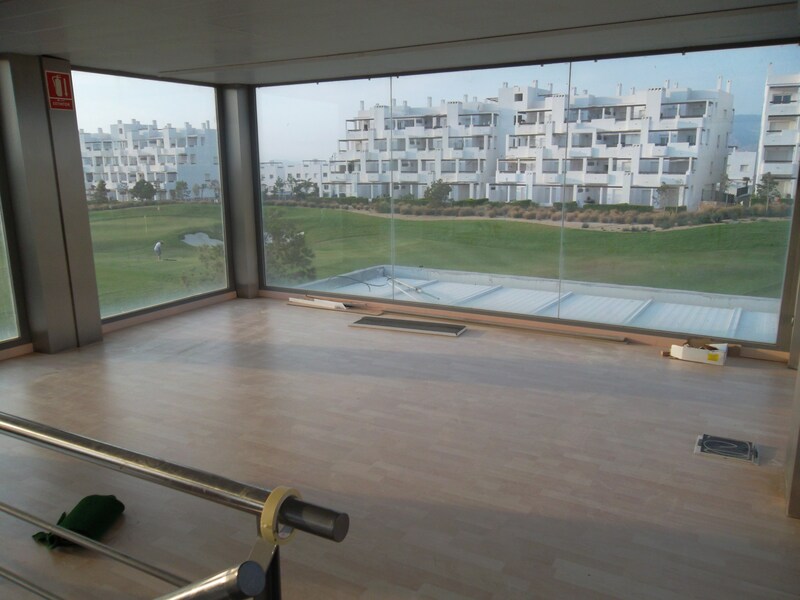 View from the driving range side………….. This tiled extension is more like a storeroom for beer barrels etc?……………. Next weeks competition is a ‘Lone Ranger’. This is basically another name for a 4 person yellow ball event. Hacienda del Alamo are putting on a special offer for Sundays in August. 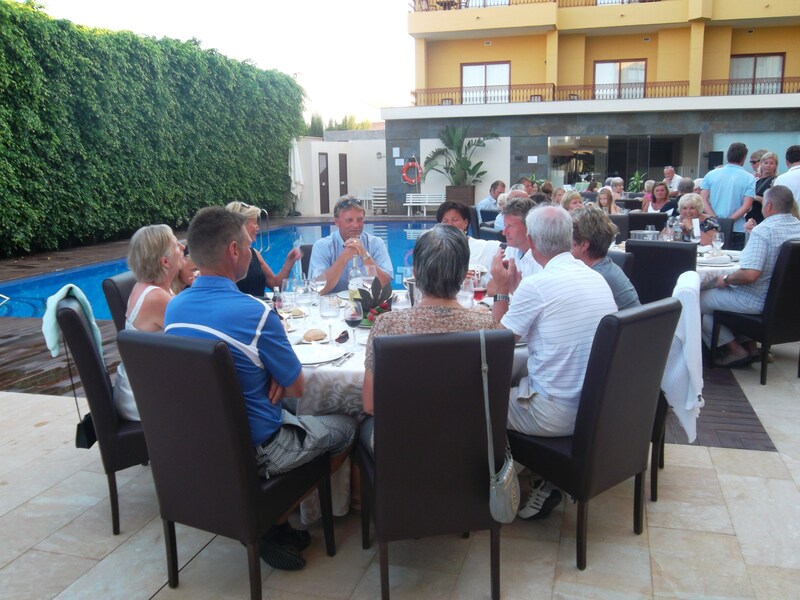 45 euros for golf and buggy with buffet meal to follow. Ring them on 0034 968157236. 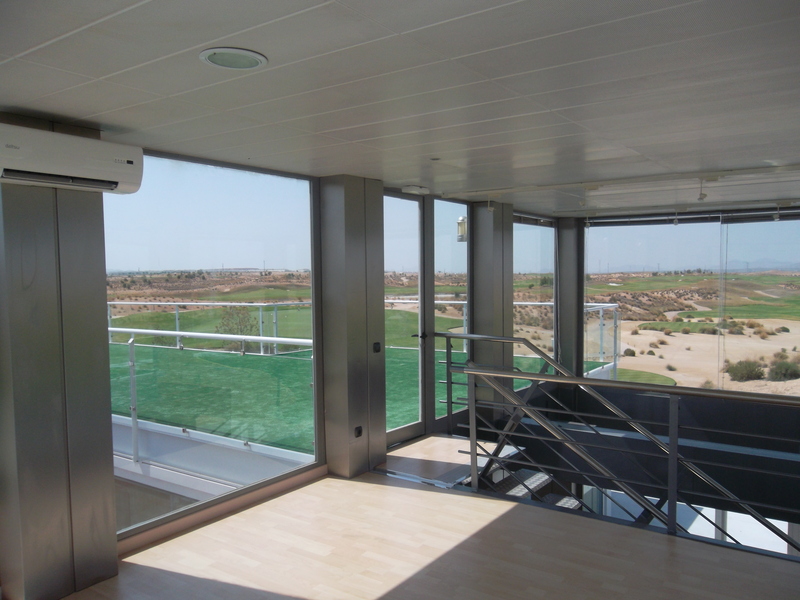 Just been told by David Kettley (Mar Menor caddymaster) that every IRM course will get 30 new buggies in August. 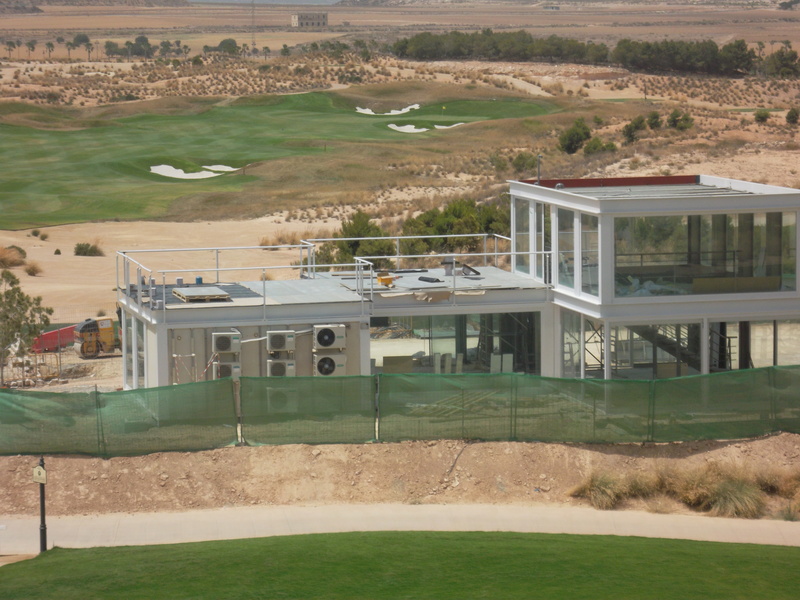 The current contract runs out at the end of July but the 14/15 we have at Condado are owned by IRM (not leased/rented as at other courses). Old buggies will be taken away to make room for new ones. 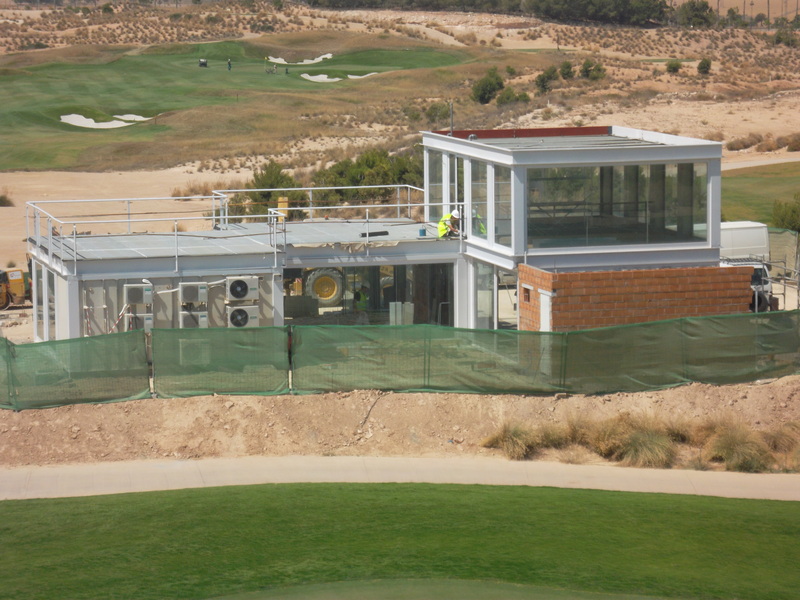 Also just looked at clubhouse and the counter at the back is the bar – saw a pump being fitted. 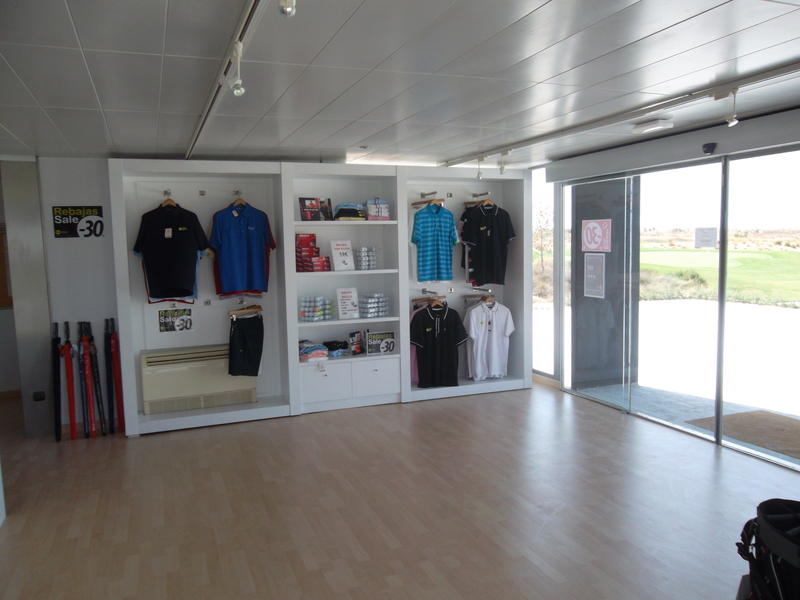 Also golf shop will be in front facing the entrance – being fitted out now. 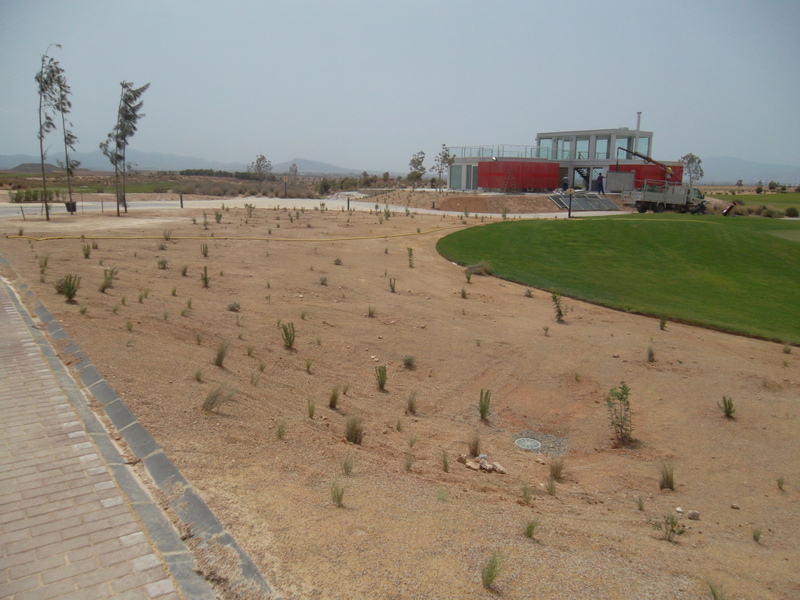 Land between chipping green and buggy path being landscaped/levelled. Air con units at back have been covered in fine mesh grids to hide them. 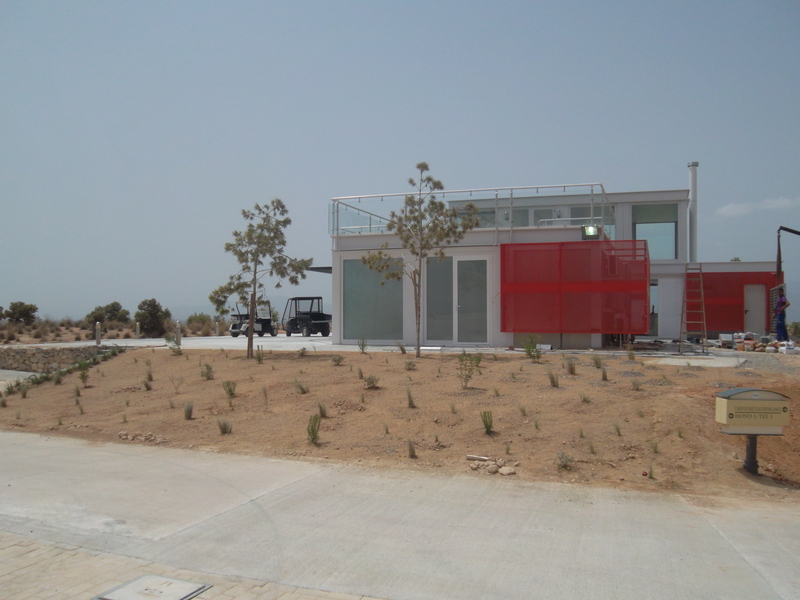 Unfortunately they have decided to paint them red which doesn’t really camouflage the eyesores! Still aiming to move Friday. Progress on the club house is continuing nicely, the steps unto the terraced area are now in and landscaping of the surrounding area has commenced. Work inside has started with the shower and changing area being fitted out no sign of the pro shop fitting or the bar yet so will will post photos as soon as they appear. 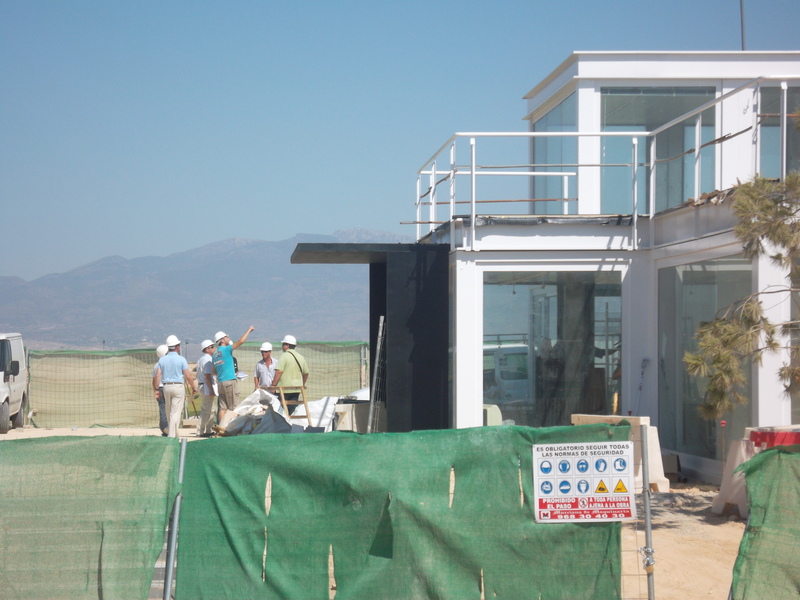 The latest opening date has been given as the end of the month so they still have a few weeks to complete all the work. 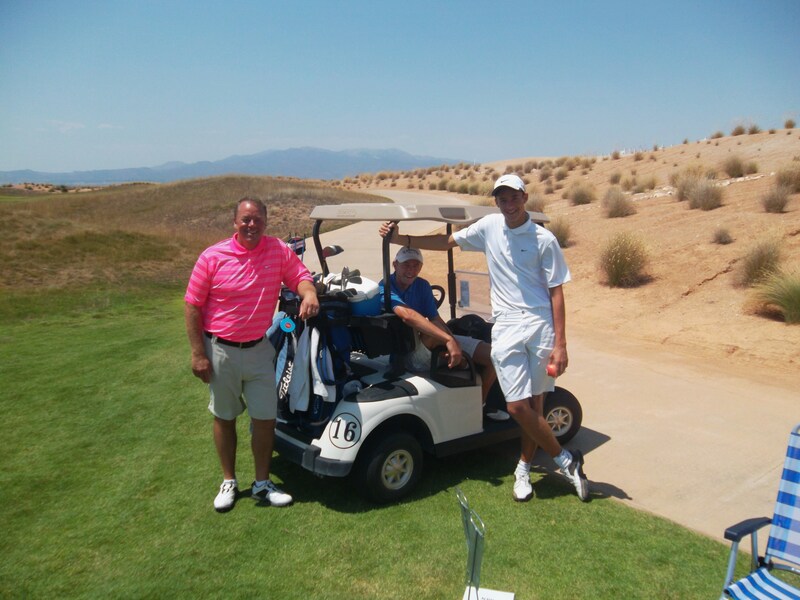 This week was the monthly Apollo Air trophy, we had 55 players taking part in very warm conditions, we are continuing to have problems with the reduction of buggies at Condado (now down to 14). So please make sure you take plenty of water onto the course. 2nd place Daniel Markenfeld 41 pts (count back) Junior player 11 years old. 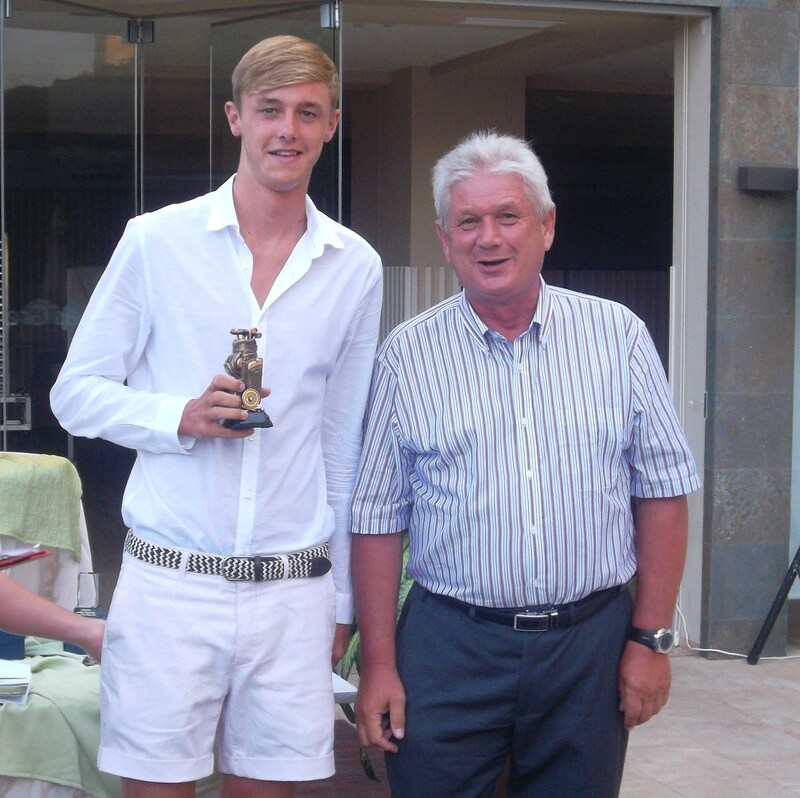 Apollo Air winner – Francis Mullally – 46pts. Monday and wednesday sheets are in the shop, sorry but there are no buggies available on Monday (16thJuly). Next friday is the Barry barker stroke play and Paul Harrington scratch cup, Please register early as we already have over 56 players and tee times are limited. We still have room for the evening presentation at Amopola Hotel in Bulanuevo, but there is no more seats on the bus, please contact Cath for info. For all booking please email Bookings@cdagolf.com rather than individuals, some times people are away or on holiday so books are being missed, if you email booking@cdagolf.com these goes to all of us so you can be sure that your request will be picked up. 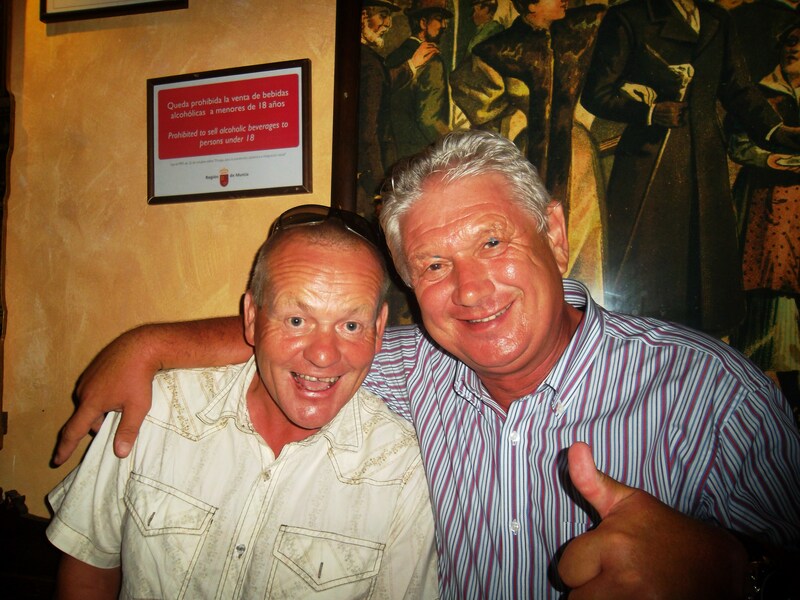 10th August is the Captains day, and the evening presentation will be held at Marianos restaurant on Campasol (a), the cost is 12 euros for 3 course meal and 5 euros if you want transport, The entertainment is being paid for by the social fund. Please book your places for the golf or the evening presentation through the society. 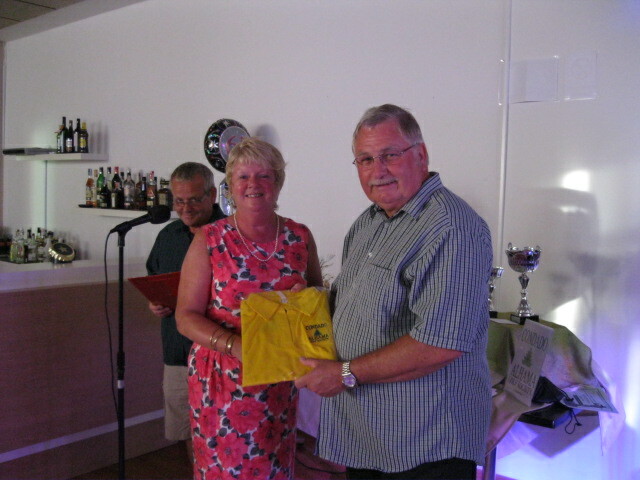 A very big thank you to Neil and Lynn who every week supply the society at the presentation with sandwiches. Barry Answer Trophy. Friday the 6th July. Around 50 players took to the course in near perfect conditions this week for the Barry Answer Trophy, the weather was not quite as hot as last week with the occasional cloud drifting by to provide a moments shade. Ladies nearest the pin – Dorothy Simpson. 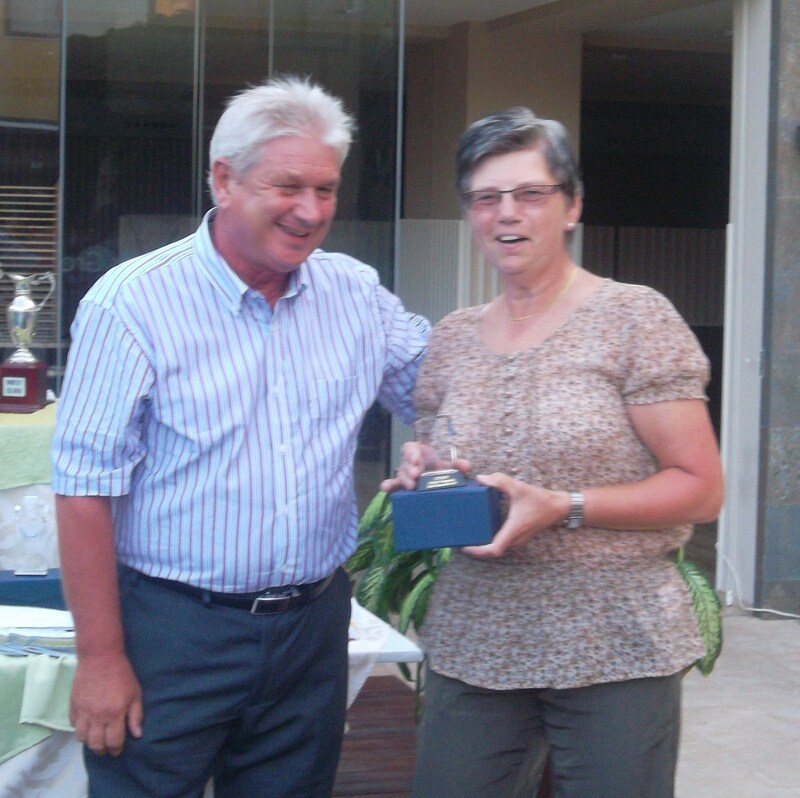 Ladies longest drive – Alicia Saunders. 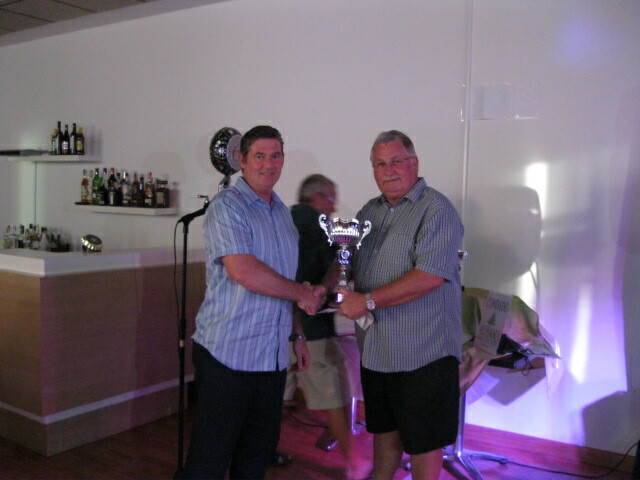 The golf day was followed by an evening at the Condado Club where we had the presentation of the Barry Answer Trophy and associated prizes, a buffet and entertainment all paid for by Barry. Thank you Barry from all who attended and hope you enjoyed your birthday celebration. 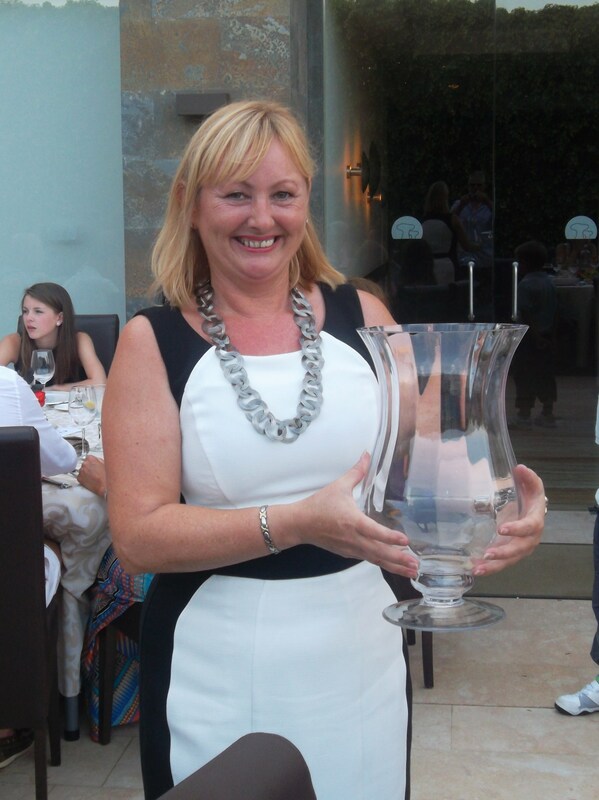 On 20th July will be the Barry Barker (stroke play) and Paul Harrington (scratch cup) Presentation at Amapola hotel Bulanuevo, 15 euros for tickets (see Cath) 5 euros return for transport, Only 55 seats on coach, so please book early. Also Captains day 10th August more information next week on presentation evening and costs. Well, I have to go back to rainy UK in the morning ( forecast is for one months rain in 2 days FRiday and Saturday! ), so just a quick update of what is happening. Just been to the clubhouse site and saw 7 bosses discussing issues while there was one worker inside! Maybe that is why Spain is in crisis. 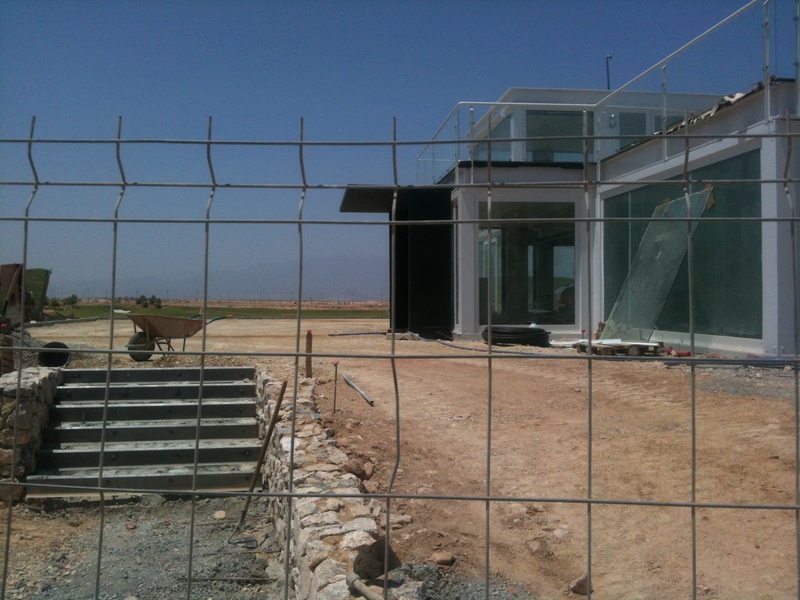 Things are moving slowly and I expect the completed project to arrive in time for the spanish holidays August 1st! Sorry if I appear to be a little negative but that is what we have become used to over the last 4 years. However, it will be worth the wait in the end. There is an extension being erected on the penthouse side of the building – no information but could it be a storeroom for the bar – beer kegs etc? The floor on the upper terrace has been felted and it looks like this part of the project should be completed soon. 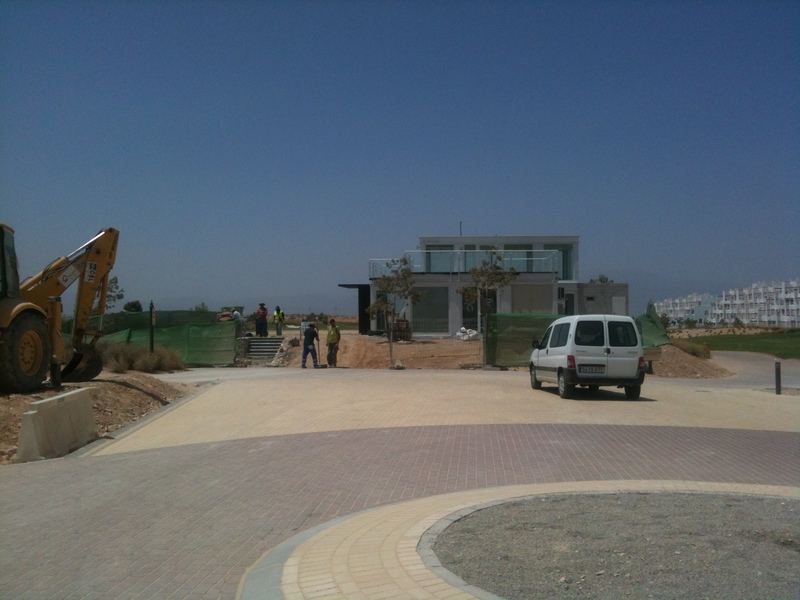 Telealhama van was there today so that suggests progress on telecommunications (TV, phone, internet, etc. ).The steps to the outside terrace are also in place, but still a lot of fine tuning to do. 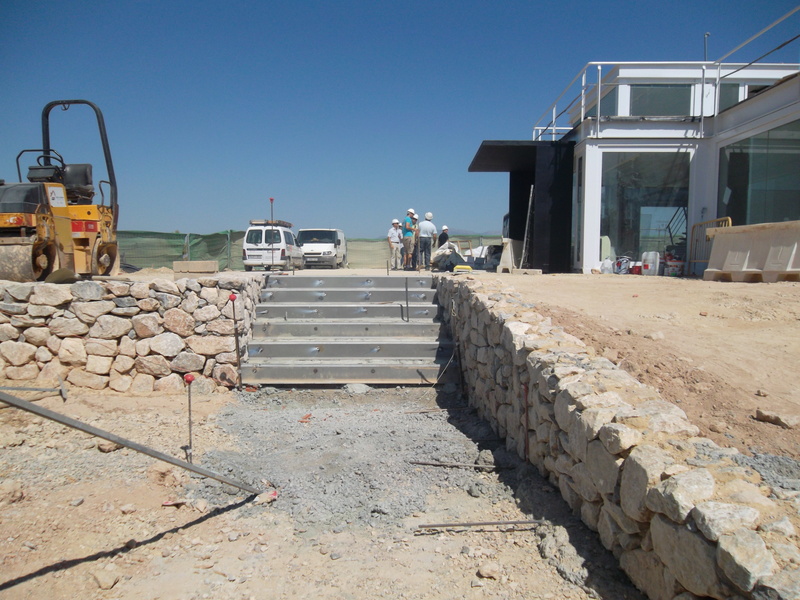 in august we will have to crawl up the steps to the watering hole…………………..
what is the mysterious building?……………………………. 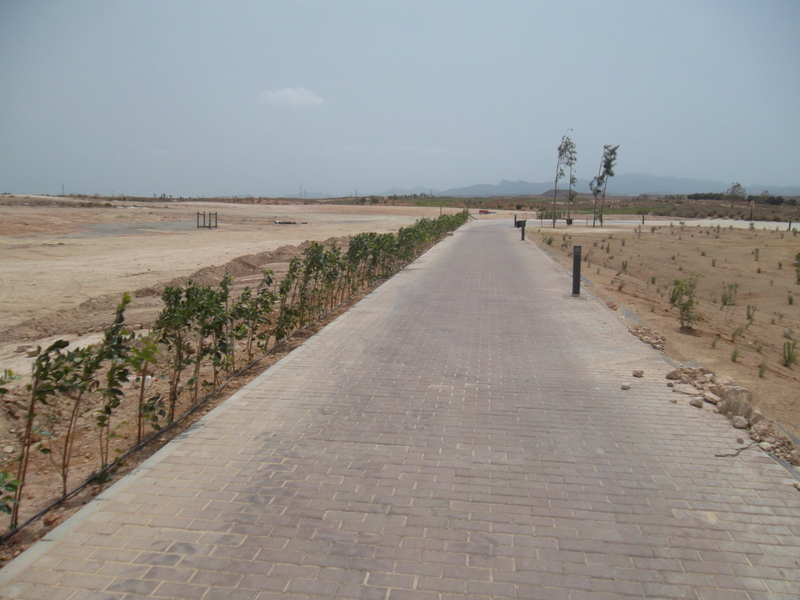 the felt has been laid and the final surface can’t be far away…………. The lakes are still low on water but the priority is to keep the course irrigated and this comes from the lakes. The course looks very good though so we will have to accept the low water levels. 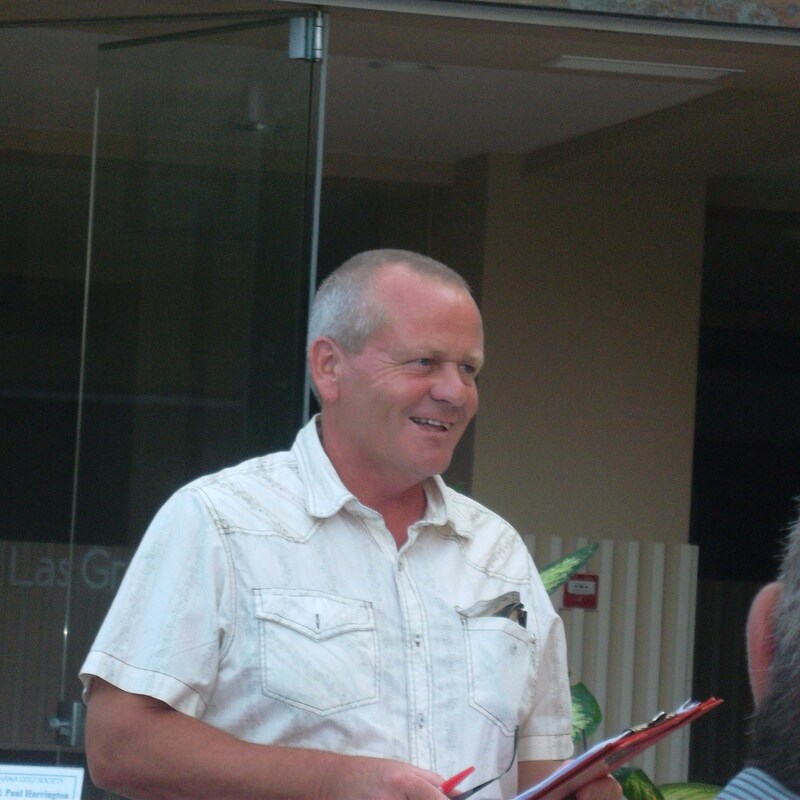 I hope the day goes well on Friday for Barry Answer’s 65th birthday comp but it should do with the excellent organisation provided by the committee. It is bound to be a good night afterwards. The marshalls are on holiday tomorrow so Ana is filling in, so as it is her 1st day, be nice to her! It is good to see that Neil (Clover) has created his own website for the bar, and has included a link to the golf society website (this should help to raise our profile). 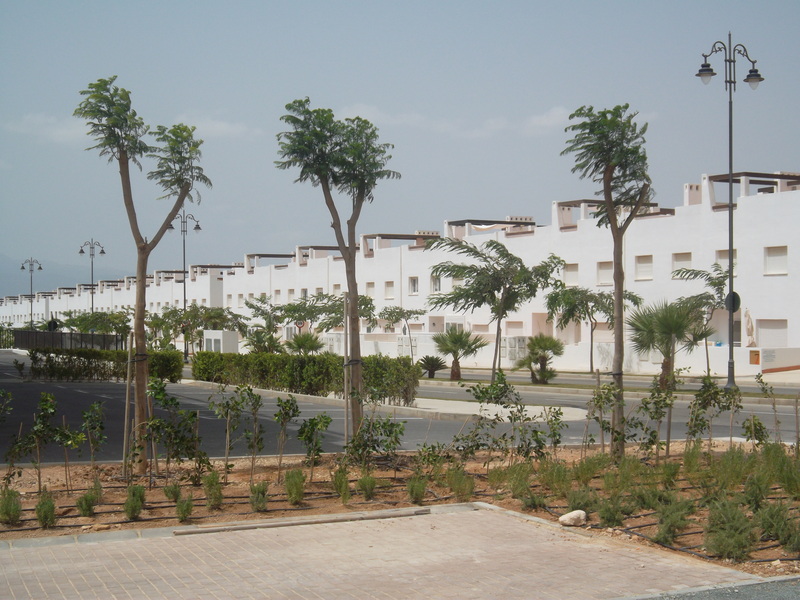 The Al Kasar is really buzzing now. Sorry last week I made a mistake with the fixtures. I said it was a 3 person team on the 13th and it would cause problems with buggies. We decided to change the format to the Apollo Air individual stableford as that is the only week in July we can have it. We will have some superb glass/crystal momentos for the Scratch/strokeplay championship on the 20th. I will bring them back from the UK with me. Just a reminder that anyone can come to the evening presentation at the Amopola restaurant in Bolneuvo – you don’t have to be a golfer or a member. It will be a great night so contact Cath if you want to join us. 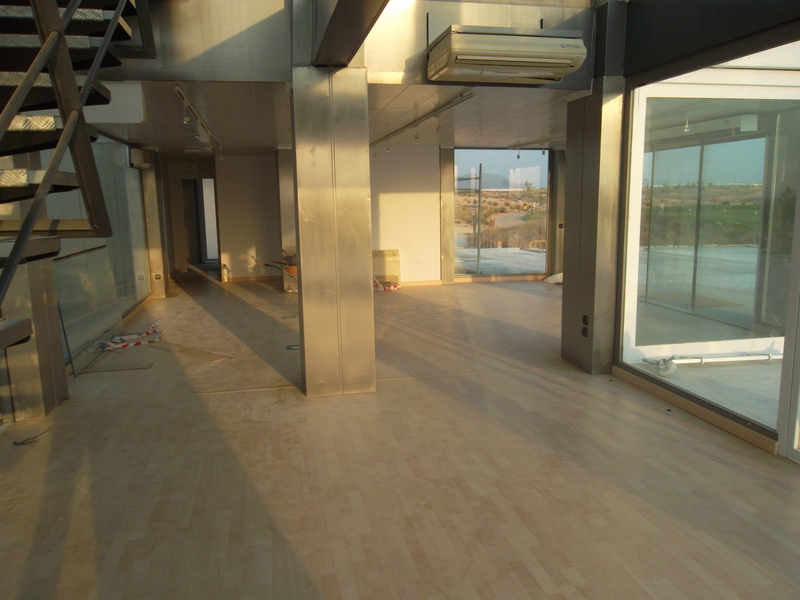 Railings fitted and floor going down…………….. 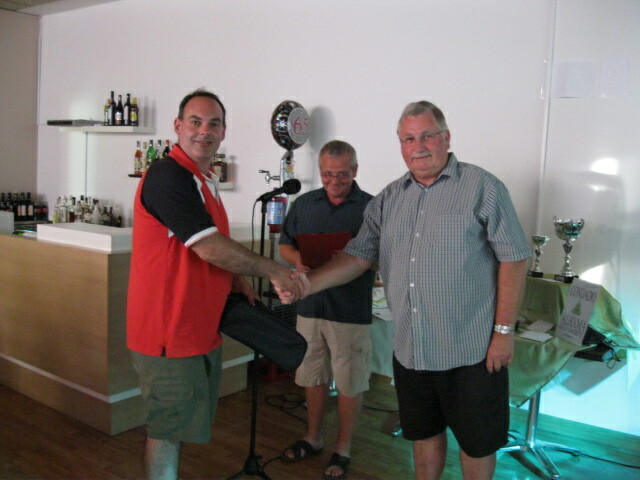 This week it was a pairs stableford competition with 46 players taking part. The intense heat meant that players needed plenty of fluids to keep hydrated – but Global Golf do not supply drinks either free of to purchase. Surely A drinks buggy should be available on the course even if we do have to pay? There were several teams vying for 2nd and 3rd place but a phenomenal score of 53pts put John Garry and Michael O’Reilly way out of reach! Check the handicap sheet next week guys! There are several big competitions coming up in the next few weeks. 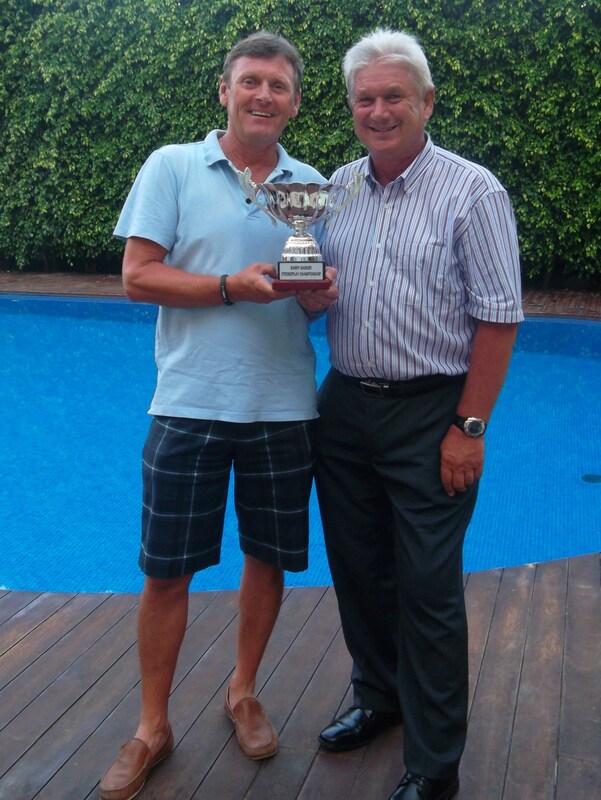 Next week is Barry Answer’s 65th birthday trophy. This will be an individual stableford. 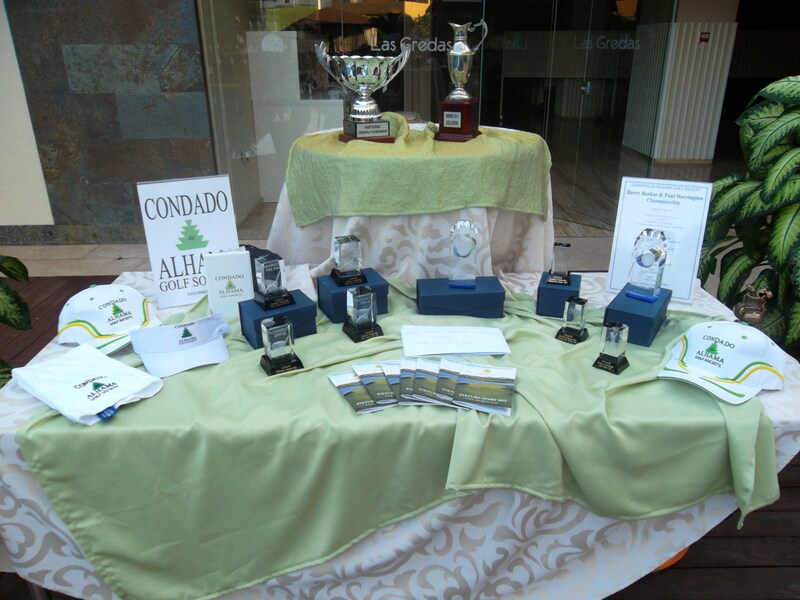 At night the presentation will be at 7.30pm in the Condado Club. There is a free buffet supplied by Barry and players will receive entry tickets for this on the 1st tee. The entertainment will be Lenny Mitchell. In 2 weeks it is a 3 person team (which may cause problems due to GG only allowing us 9 buggies (this is a major problem in 50 degree heat out on the course and needs addressing). 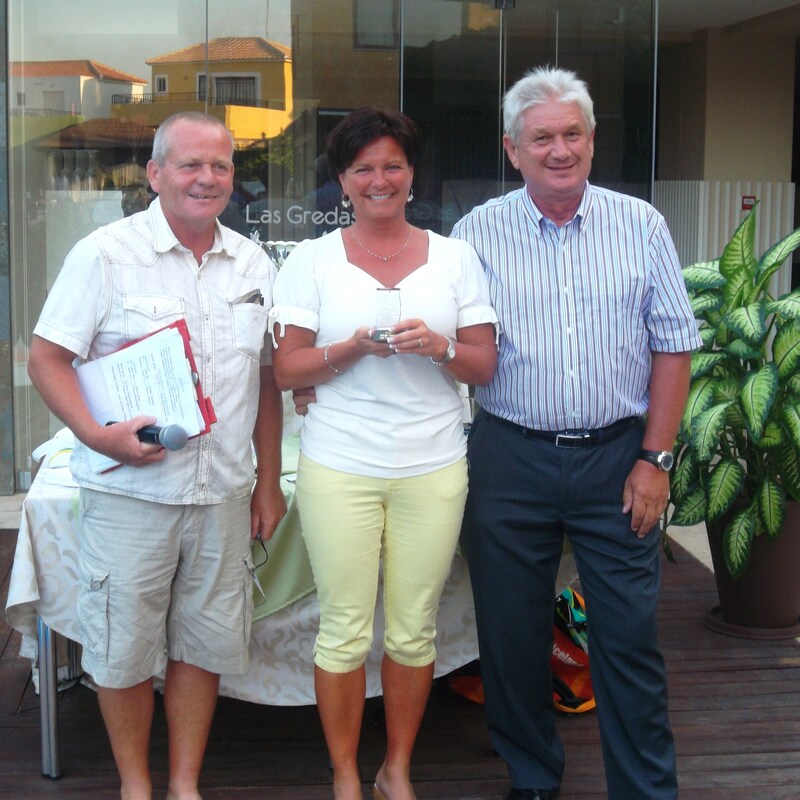 July 20th is the true test of golf – the Strokeplay Championship and Scratch Cup where every shot counts. You can’t get away with having a disastrous hole with no points – a 10 is a 10! 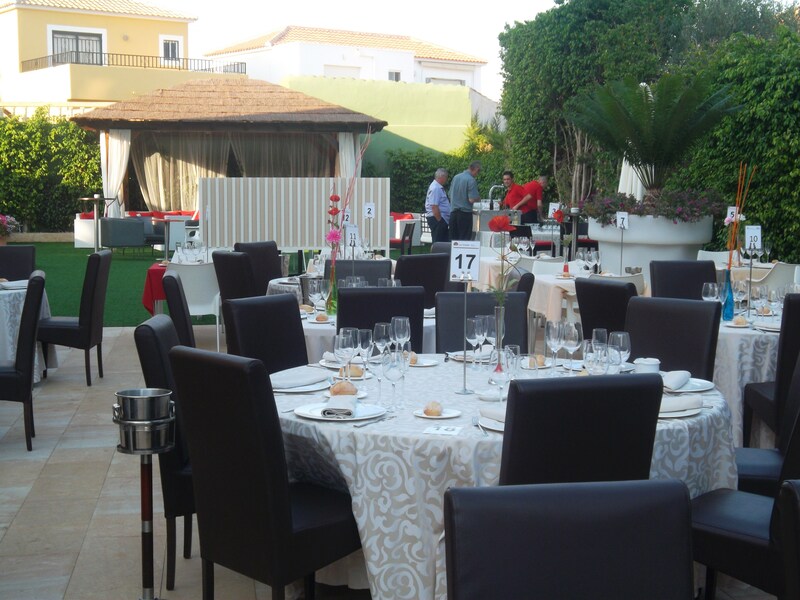 The evening presentation is at the Amopola restaurant (poolside) in Bolneuvo. Be aware this is a change from the fixture book and is NOT July 13th. August 10th is Captains Day and is the pinnacle of the years golf. 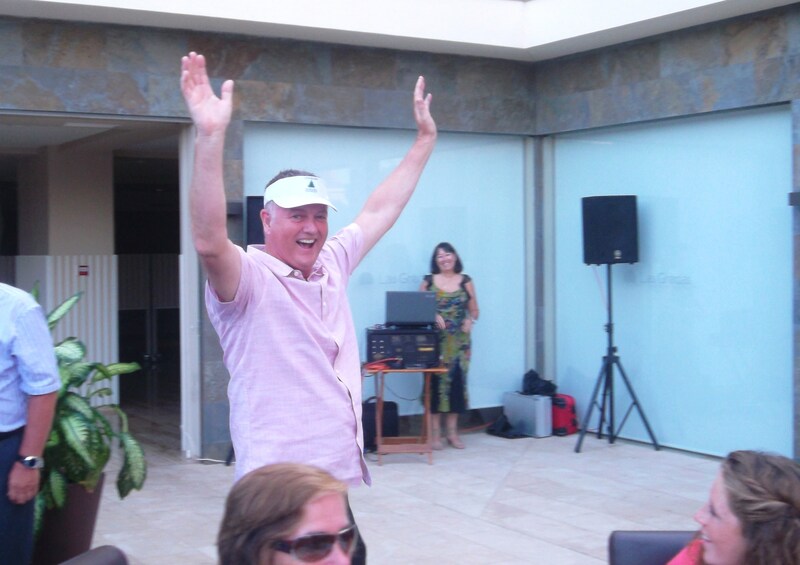 Lots of prizes and a great night out at Mariano’s restaurant in Camposol A.
September 14th will see our first ladies championship – so come on ladies make a special effort to be our first champion! There will be an evening presentation at a venue still to be decided. 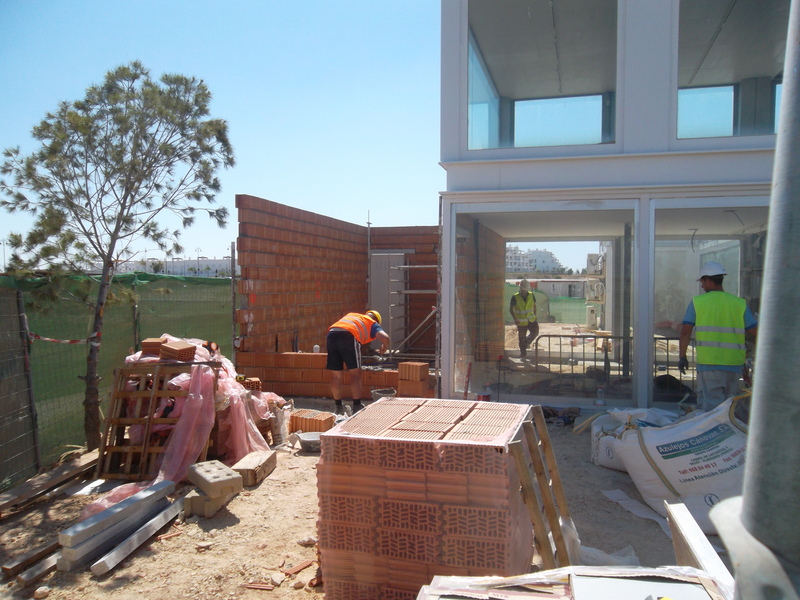 The clubhouse is progressing well. We have been informed that it should open July 15th and it is possible that it could be around then. Workers have been on site Saturday and Sunday so that is why I can’t get in to take pictures. Railings have been erected around the upstairs terrace, and the floor is being installed. The wall bordering the outside terrace is just about complete. 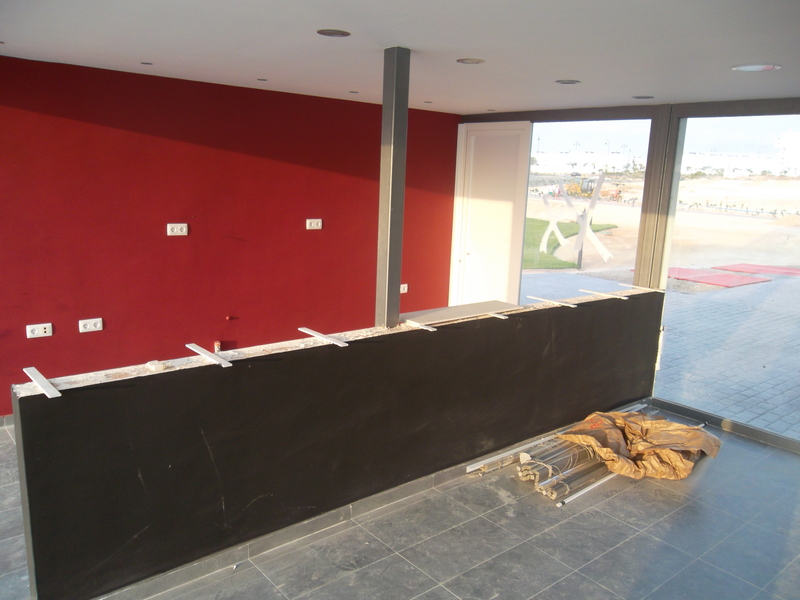 The desk for the golf shop will be directly facing the sliding entrance doors with possibly golfing goods at either side. I still don’t know where the bar will be, who will be running it or what time it will close. 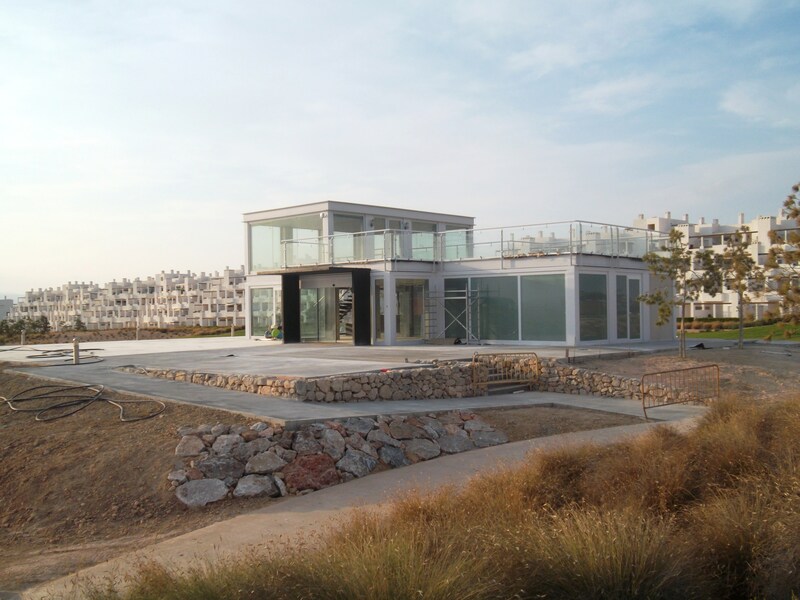 But if it is suitably surrounded with flowers and shrubs it should look fantastic (for a temporary clubhouse). 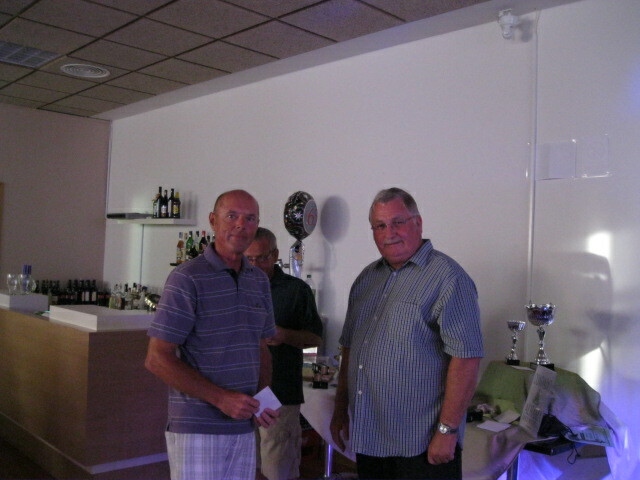 The monthly members draw took place on Friday. The winning number was 440 – Matt Gibson. 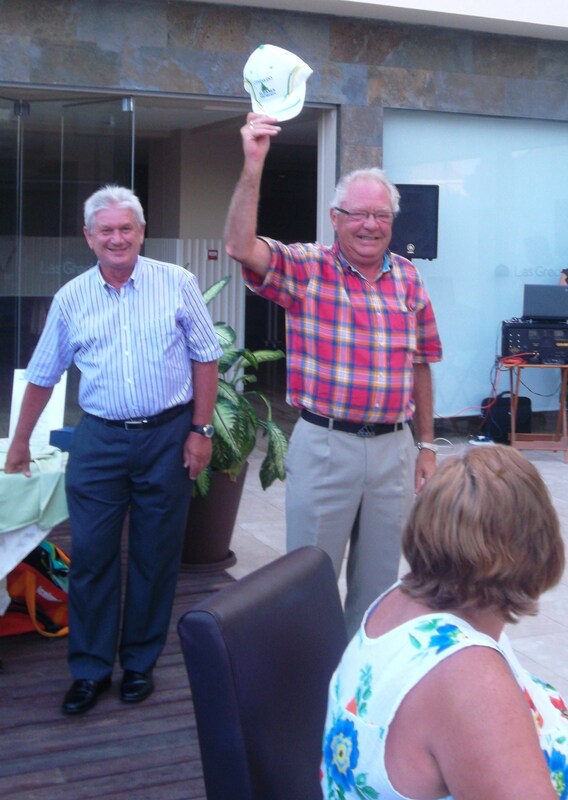 He received 2 vouchers to be used on any Global Golf course. Sorry, but next week I have to go to UK (again!) for a wedding. So maybe Phil will update you for the next couple of weeks. I expect to go into the clubhouse for a pint on July 16th!